Well, I am not a huge fan of German style wheat beers. However, American style wheat beers, where a clean, American ale yeast is used instead of the German weizen yeast, I do find enjoyable on a hot summer day. 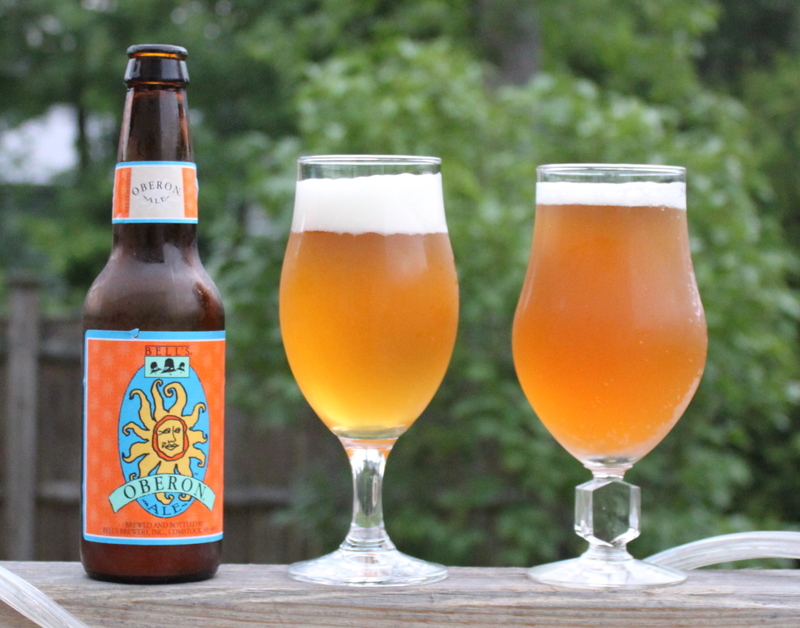 The first one I ever had and the one that still defines the style for me is Oberon, originally called Solsun, brewed by Bell’s out of Kalamazoo, Michigan. It has this light, citrusy note at the end that was the hallmark of the beer. I had Oberon not long ago when I was back in Michigan, and I have to say, it did not taste like I remembered it. Likely I remember it with rose colored beer goggles, but it did not have nearly the citrusy taste I recalled, and it was more bitter, not as smooth. So I set out to recreate a version of this American wheat as I recalled it. I did some digging, and found a nice post on another blog with some tips on making the beer from some of the folks from Bell’s. I figured this was a good starting point, and tweaked it from there. First thing, the yeast. Bell’s has said they use their standard house yeast in this, which is generally clean, and pretty well attenuating strain. You can get it from the bottle, but I decided to use Safale 05. I believe Bell’s yeast derived from the Chico strain, so this looked like a safe bet. The thing I wanted to nail was the hint of citrus that makes it so dang refreshing. Again, Bell’s has said they do not put any spices in this, so I figured that flavor must come from the hops. Noble hops make up the backbone of this beer, but I suspect it is dryhopped with some American hops to get that citrusy aroma and character. So, I decided to add my favorite American hop, Centennial, to the mix. Also, I did not have any “Noble” hops besides Saaz, so I used some Sterling I had for bittering/flavor. I have not been overly impressed with Sterling as a stand alone, but here, I was looking for IBU’s, and it does have a mild Saaz like flavor. Additionally, to boost the hop character of this beer, I decided to not do full boil hops, instead starting at 30 minutes and to use more hops to get more character. Finally, it sounds like Oberon is 50/50 wheat malt/barley malt, but I was a bit worried about sparging, so I went more 40/60. The recipe is below. This was mashed with a 1/4 pound of rice hulls at single infusion at 152F for 1 hour. Then I sparged it, and boiled for 60 minutes. The OG was 1.052, with a FG of 1.010, giving me a 5.5% beer with 25.7 IBU’s. I did primary for 7 days in the low 60’s ambient, then added the dryhops to the primary, then after 7 more days, kegged it. Tasting: Color — orange hued and cloudy, with a nice head that hangs on down the glass. The aroma has the citrusy of the centennial in the back, with the floral/honey notes of the saaz, subtle, but there. Also, you can smell the wheat, and a bit of peach, I think from the yeast. The beer tastes very smooth, a touch on the sweeter side. The hops are there, but not bitey at all. Again, the wheat stands out. The body is pretty middle of the road, and there is a residual sweetness from the malt that mixes nicely with the floral notes of the hops. Overall, I like the beer, and this is closer to what I remember Solsun being then what Oberon actually is. As you can tell by the picture, Oberon is a shade lighter in color. It does not have the citrusy note on the nose, much more spicy from German hops, and it is pretty dry. It is definitely more crisp then mine. That is probably the one thing I would change, knock down the crystal malt a touch, and up the fermentability to get a drier beer. However, I think I really got the hops profile I wanted, and would leave that alone if I brew this again.